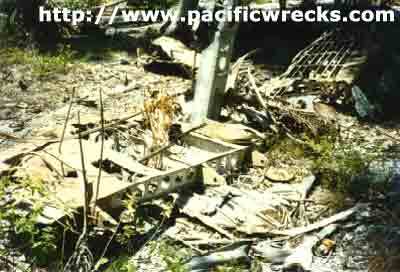 Pacific Wrecks - B-24 Liberator Serial Number ? B-24 Liberator Serial Number ? Built by Consolidated at San Diego. Delivered to the U. S. Army. Ferried overseas to Hawaii. Assigned to the 7th Air Force. No known nickname or nose art. This B-24 was abandoned at Abemama Airfield. The wreckage of this B-24 was relocated near the island council office, about 10 miles from Abemama Airfield. Badly chopped up but very little corrosion. Tail sections with one of the rudder fins and one engine remain.